“After the crew stopped the housemates from going out of the house, Bigg Boss demanded an apology from all of them as it is against the rules to break out of the house. The other three apologised but Rahul refused to do so. That’s why he was evicted from the house,” says a source. Endemol’s Managing Director (India) Deepak Dhar was unavailable for comment despite several attempts. 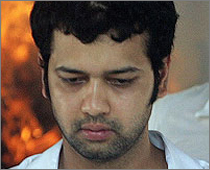 Endemol sources refused to confirm or deny Rahul Mahajan’s eviction. Rahul, on his part, asked to be evicted with whatever amount he deserved to get for 90 days, saying he didn’t feel like staying on any longer. And Rakhi Vijayan, who was voted out of the show on Saturday, was seen playing a strange mix of a trouble-maker and trouble-shooter between Rahul and Monica. The actress, best known for playing Sweety in comedy serial Hum Paanch, went to the Bigg Boss house after a troubled marriage with Raveena Tandon’s brother Rajiv. Rahul too is on the show after his marriage to long-time sweetheart Shweta ended. To compound the strangeness of the situation is Payal, who has been seriously linked to Rahul after his break-up. So who scripted this bizarre quadrangle? Destiny or the Bigg Boss spin-doctors? One wonders how the Rahul-Payal real-life pair were thrown together in the seclusion of the game show house. A question that one of the contestants – comedian Ehsaan Qureshi – brought up not so gently on live camera. He also accused Rahul of stealing into the girls’ chamber in the middle of the night after wrenching off his microphone – something that is strictly against the Bigg Boss rules. Even Monica, former companion of gangster Abu Salem, has been repeatedly reprimanded by Big Boss for doing away with the mandatory mike. The question is whom is Rahul Mahajan interested in – Payal Rohatgi or Monica Bedi? On the Bigg Boss cameras he seems to be completely ignoring Payal and lavishing interest on Monica. In fact, Rakhi was heard scolding Rahul last week for “freaking” Monica out by flirting with her. To this Rahul replied that he was only indulging in some “time pass”. Mahajan’s constant attention to Monica could be a ruse to throw spectators off the Payal trail. But it could be a very dangerous ruse.